Knowing the internals of how a system works has always fascinated me. Although a bit theoretical, knowing about query evaluation is a very exciting topic and I attempt to learn something new about it every now and then. One of my seniors had a mantra which I remember till date – when evaluating a logical “AND” condition, the costliest condition should always be the last one to be evaluated. Today, I will try to demonstrate why this is a good practice. The evaluation of the logical AND is actually quite simple. A set of checks evaluate to FALSE even if one of the checks returns FALSE. This simple rule means that the AND evaluation must be a “short-circuit” operation, i.e. as soon as a condition is encountered which determines the end result, all checks beyond that point can be ignored. The test below demonstrates this concept. What I have in the script is a simple query that returns results based on the evaluation of two conditions – one of which is bound to raise an exception. In this first query, the first condition itself evaluates to FALSE. Hence, there is no reason for the evaluation of the logical AND to continue. The query therefore returns no results. Had both conditions been evaluated, we would have received an exception. All conditions were evaluated resulting in an exception! Error Message : Divide by zero error encountered. Because the first condition retuned a TRUE in the query above, it returned an exception because the evaluation of the logical AND operation had to evaluate both conditions. This simple test proves that the logical AND operation is a “short-circuit” operation. Therefore, the costliest condition (maybe a sub-query) in a set to be evaluated with a logical AND must be placed towards the end of the sequence to prevent un-necessary evaluations. Only if the preceding conditions are TRUE, will the more complex conditions be evaluated under this logic. 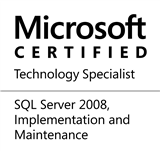 This entry was posted in #SQLServer, Blog, Imported from BeyondRelational and tagged #SQLServer on July 18, 2013 by nakulvachhrajani. When I am swapping conditions in 1st query, still it is give same result. You will find that SQL Server does a constant scan – it does not even go to the table (this can be seen from the Actual Execution plan also). You can try executing these queries and validate the execution plan & performance to understand the importance of the placement. It is not guaranteed that placement of conditions affects result and/or performance. Here, Result is same and execution plan is same. Again, result is same and execution plan also. Even, 1=0 condition is written second, SQL Server performs constant scan first and don’t scan table. Here, even if first criteria (BusinessEntityID =0) evaluate to FALSE , still it perform 2nd criteria. And also, this time its not constant scan. Here, it actually affects result. If column has any non-numeric data, then 2nd query will throw error. @harsh: I guess we are both saying the same thing, but in different ways. Because the logical AND is a short-circuit operator, in most cases one can gain some benefit by writing a query such that the database engine can easily determine whether to continue the evaluation of all the expressions in the AND or not. This is why I propose that the most complex query, which may not be the most decisive may be placed towards the end. Of course, these recommendations depend upon the nature of data in a system and the design of the quries (for example, if all conditions are simple comparisions, one may not gain at all. But, if sub-queries are involved, a gain may be seen if the preceeding conditions tend to evaluate to “false” often).